Could YOU make a driver bag?? Our community nursing team approached us to see if we were able to supply them with Syringe driver bags, as they had a continual need for them. A bit of reasearch put us in touch with the wonderful Julie at "makingforcharity", a non profit organisation whose aim is to provide syringe driver bags to hospitals and hospices, as well as Lee Fisher at Interior Goods Direct, who has generously donated fabrics to us. The bags are reversible and made of washable materials. "Each bag is donated to one person. They are not transferable due to the possibility of cross infection. Sadly, this means there is a constant demand.". 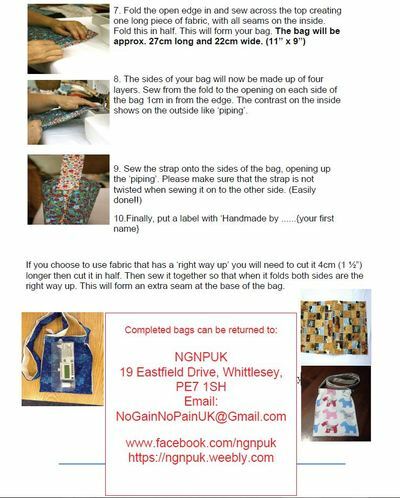 The bags we supply at NGNPUK are used within the patients home and make a real difference. It means a great deal that someone has taken the time to hand make a bag for them. 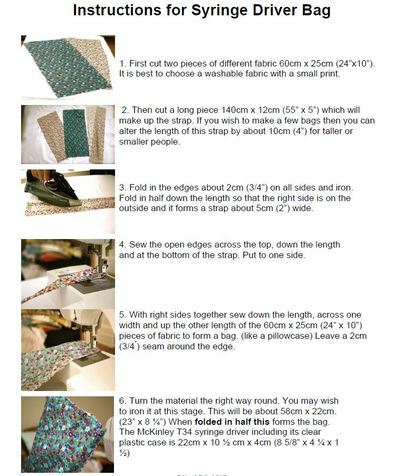 The making for charity team have provided us with an easy pattern for making Syringe driver bags, the only ingredient needed... is you!! If you would like to have a go, or are part of a crafting group, feel free to download the instructions from this page. If you would like some material, please get in touch as we can provide you with some. All completed bags can be returned to us here at NGNPUK, and we will ensure they get to where they are needed. For further info, you can contact us or visit our Facebook page.